Creating a niche in the industry, we offer our clients our range of high grade Welding Rectifier which we supply in wide range. Our welding rectifiers are designed for various welding applications complete with required accessories for trouble free operation. 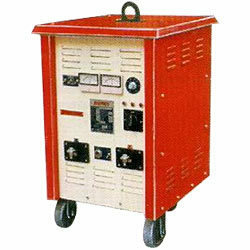 These welding rectifiers are very efficient and long lasting available at reasonable prices. Along with several other supreme quality welding equipments and materials we are also engaged in the line of supply of one of the finest and greatest kinds of MTW Welding Rectifier. These Welding Rectifier - MTW A6 Series have been designed, constructed and fabricated in an excellent manner at leading companies which we are obtaining and supplying in each and every part of the country. These Welding Rectifier - MTW A6 Series are used for the welding purposes in several industrial and mechanical utilities. Looking for Welding Rectifier ?